The wrist (carpus) is made up of many bones which are connected by a complex series of ligaments. These ligaments act to keep the bones in place when your wrist moves and when you load your wrist such as when gripping objects and pushing a door. 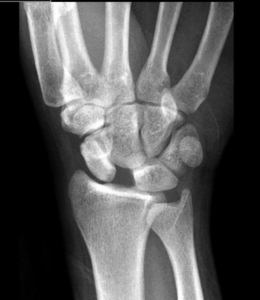 The scapho-lunate ligament is a particularly important wrist ligament in the centre of your wrist that holds the scaphoid and lunate bones together. Mr Naqui has a particular interest in the management of these injuries, having done published research in this area. Link the blog on scapholunate research. Ligament injuries typically occur after a fall on the outstretched hand. They can also occur as a result of sporting injuries. Patients may experience pain, swelling and bruising in the wrist. Movements of the wrist may be painful and restricted. Grip strength is often reduced. Pain can be felt when attempting to load the wrist such as when getting out of a chair. On examining there can be pin-point tenderness over the affected ligament. The first step is to undergo a consultation, involving a medical history and clinical examination. Mr Naqui usually organises further tests such as an x-ray or MRI scan. These may help to identify the extent of any ligament injury and any associated fractures. Treatment will depend on whether there has been a sprain, partial tear or complete tear of the ligament. This will be taken in context of the patient’s symptoms and degree of functional impairment. Sprains and partial tears are usually treated conservatively by a combination of splintage and highly specific wrist strengthening exercises. The prognosis of sprain and partial tears is generally good with restoration of normal function and resolution of symptoms expected with conservative measures. If there is a complete tear of the ligament or persistent ongoing pain for some time then Mr Naqui may advise a wrist arthroscopy as an initial surgical procedure. Wrist arthroscopy details can be found here. In the acute setting a torn ligament can be repaired if required. If possible, this is done through key hole surgery or sometimes through open surgery. The torn ligament will be reattached with sutures to bone. If the ligament has been injured for some months, then reconstructive surgery (where a new ligament is fashioned) can be performed. This is also day case surgery and the steps will be carefully described to you by Mr Naqui. The hand will be placed in a cast following the surgery for around 4 weeks. This will be removed at clinic. Any sutures inserted will be removed at around 10 days. Pain and swelling are common following surgery, these should settle after a few days with simple painkillers. Infection is rare. Stiffness at the joint should improve if you follow the exercise programme as advised by Mr Naqui and the hand therapist following surgery. Injury to nerves around the wrist may occur during surgery and lead to a feeling of numbness around the scar area. In a proportion of patients restoration of full strength and movement does not occur. If this were to happen then Mr Naqui will discuss further options.